I recently attended the Newspring Leadership Conference and got the chance to listen to some of the greatest preachers in America for nearly twelve hours of worship and learning. I wanted to share some of the things I gleaned from this conference, and I thought I would begin with some straight up wisdom on preaching that Andy Stanley, pastor of Northpoint Church in Atlanta laid on the crowd of nearly four thousand. Northpoint Church was started some seventeen years ago with a particular focus: to be the kind of church that unchurched people would love to attend. Northpoint is now either the second or third largest church in the U.S. with multiple campuses and over 30,000 members, and still has that same focus. 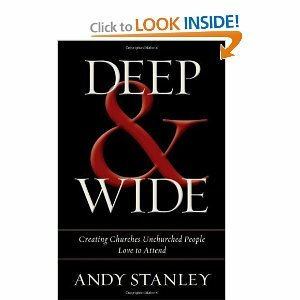 Andy Stanley has recently written a book entitled, "Deep & Wide: Creating Churches Unchurched People Love to Attend," that chronicles the journey of Northpoint, and offers some guidelines for church leaders who truly want to reach people who aren't actually coming to church. The book can be pre-ordered on Amazon here. I got an advance copy. Nanny nanny boo boo stick you head in doo doo. 1. Let Them Know You Know They're Out There & That You're Happy About It. Andy uses phrases like, "If you're here for the first time, and you're worried about being around a bunch of religious people, don't worry... we're not very religious either." or "I know some of you came today because someone bribed you with dinner if you did." If you have unchurched people in your audience, Andy states, you may need to start a little further back with your message. Make what you are teaching so interesting that the audience will want to go home and read the Scripture passage again. Don't assume that people know the Bible, you need to slow your roll when it comes to biblical references, etc. And frequently will say to people that a particular part of the sermon is "for Christians only," or will say, "Today's text may make you glad that you aren't a Christian." He believes that when you give unchurched people an "out" they will respond by leaning in." He taught us that we have no right to judge people who aren't Christians and lay our expectations on them. He said, "We don't police our own behavior because we're too busy policing the behavior of everyone else." 4. Avoid Saying "The Bible Says"
This was one of the most challenging and awesome teachings that Stanley gave to us. He told us, "When you present the Bible as a book, you do it a disservice. It's way better than a book." He said that many Christians have presented the Bible as this holistic sort of thing that you must accept in toto, and the moment that something in that gets challenged it can tumble like a stack of cards. Stanley said he's worried less about people believing there was a real Adam and Eve, and more about whether they believe in a Risen Savior, who was actually seen and testified about by a ton of early Christians. Just tell people that something in the Bible is weird if it's weird. Let's face it, there's some weird stuff in it. Sometimes Andy will actually say, "If I weren't a Christian, I probably wouldn't believe this either." The foundation of our faith isn't a book, though, Andy said, it's an event: the Resurrection. As a general rule, Stanley told us, "when you say what you suspect unbelievers are thinking, it gives you credibility. He also told us don't create the impression that one must choose between faith and science, which a lot of Christians tend to do. He then quoted Acts 15:19, the words of James, the brother of Jesus: "It is my judgement, therefore, that we should not make it difficult for the Gentiles who are turning to God." "Remove very single obstacle," Andy finished, "except the offense of the cross."